GiveMeTappers! We’ve been waiting for this day for some time now! I’ve wanted to tell you all for so long but have been waiting for the right time. 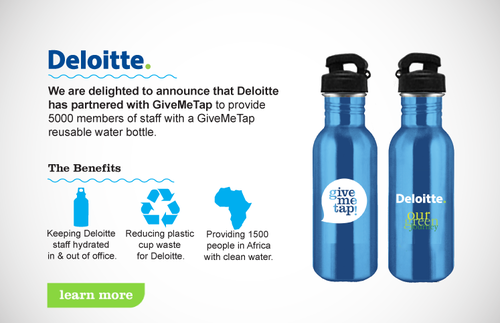 Today, I am so happy to announce that GiveMeTap is partnering with Deloitte to provide 5,000 reusable GiveMeTap water bottles to their members of staff, across the UK! Deloitte, through their Our Green Journey initiative, purchased 5,000 co-branded reusable water bottles to give away to staff in order to cut down on the large volume of plastic cups they (as a company) were throwing away each day. By giving staff a reusable water bottle, millions of plastic cups will be saved from going to landfills each year, and crucially, through this partnership, another 1500 people in three communities in Ghana will be provided with access to clean drinking water for life. What’s more so many Taps will be getting visits from these new GiveMeTappers. I’ll be at the Deloitte offices on Wednesday 30th January and Friday 1st May to meet with staff and hand them their lovely new bottle. Over the course of the next coming weeks, desks at over 23 Deloitte offices will be shining with blue GiveMeTap water bottles placed on their desk. Working with Deloitte to make this partnership a reality has been a truly amazing experience for me personally. It’s GiveMeTap’s single biggest order/deal to date, and will enable us to continue to improve the lives of so many more people in need of clean drinking water. This is why we exist! Everytime a Deloitte staff member takes a sip of water out of their reusable bottle, their will be supporting the environment and contributing to the development of African water projects. Water for you. Water for everyone. It takes bottle to make a difference and Deloitte have this in abundance. We want everyone to know about the impact that switching from plastic cups/bottles to GiveMeTap bottles has, so please share this great news with your friends and family.